This morning I had a patient ask me about the media coverage regarding the cause of death of model Katie May in February. This is a terrible story and we share our condolences with the family and friends but should be put into perspective. Below is a statement from Palmer College of Chiropractic, both Dr. S and my, alma mater. Research shows chiropractic is a safe and effective treatment for musculoskeletal conditions, including neck pain and headaches., when compared to other treatments available. 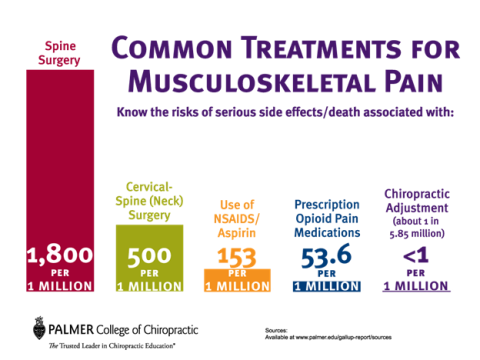 The following chart provides information regarding some of these treatments. It’s important that all health-care providers, including doctors of chiropractic, be aware of the signs and symptoms associated with CAD so they can make appropriate referrals when necessary. The doctors at ProActive Chiropractic are very familiar so we can refer you out to the hospital. It’s equally important that patients are given accurate, evidence-based facts about the risks and benefits of all available treatments so they’re able to make an informed decision.